Artful Affirmations: Tea Cup Tuesdays-Holiday Cheer! 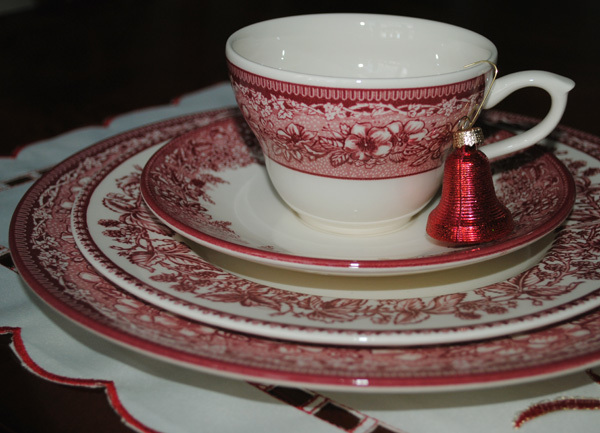 Well, you know I LOVE your teacup as I collect red transferware! What a pretty pattern and it's perfect for Christmas-time! I like the wee bell accompanying too. 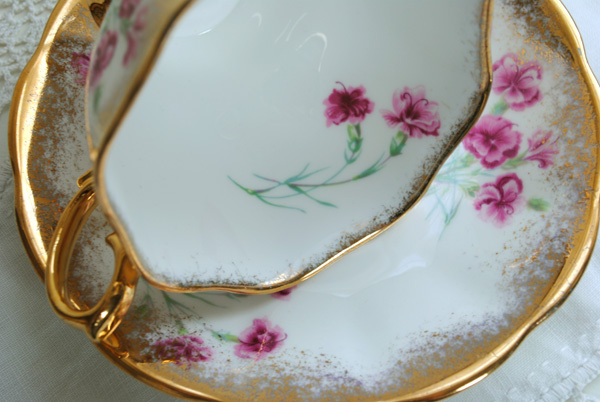 Would love to win your pretty teacup; lovely! I LOVE the color on the dishes ... so rich and definitely full of good cheer! I'd love to win the teacup! Thank you for hosting. Merry Christmas and Happy Tea Day! I would love to enter your drawing! I love red transferware...it is indeed perfect for Christmas! Happy TT and thanks for hosting! Oh, what a pretty red cup! Love that pattern. I also love your giveaway cup. I am a follower and would love to win that. I love Royal Albert cups. Thank you for hosting and have a very Merry Christmas and a Happy New Year! Would love to be a winner! 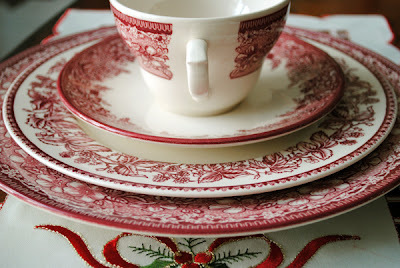 And your post is a winner with red transfer ware. Just lovely! Terri - that cup is very festive and lovely..I can not get over how beautiful that RA cup is oh my gosh!!!!! The gold trim, well just stunning. Merry Christmas and thank you for all your inspiring lovely tea cup posts...you might not know this but you keep my hunt during antiquing more fun because now I have learned so much about stamps and marks I turn everything over! HA! Wow, how can you bear to part with that lovely cup? I am certainly willing to give it a good home. Stop by my place some time or you could reach me at momwaldsplace@gmail.com if I am lucky enough to win your giveaway. 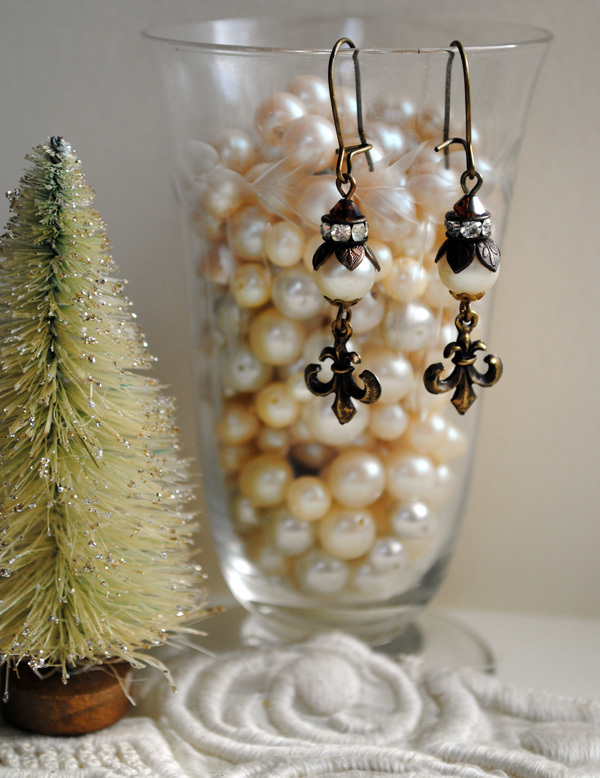 Someone as generous as you is sure to have the Merriest of Christmas! Oh I just adore your red teacup, sooo lovely! Perfect for the Christmas season. I'm a foloower and would love to win the teacup, it'll be my first in transfer ware. Thank you for hosting lovely lady. Wishing you the merriest of Christmas and many blessings. 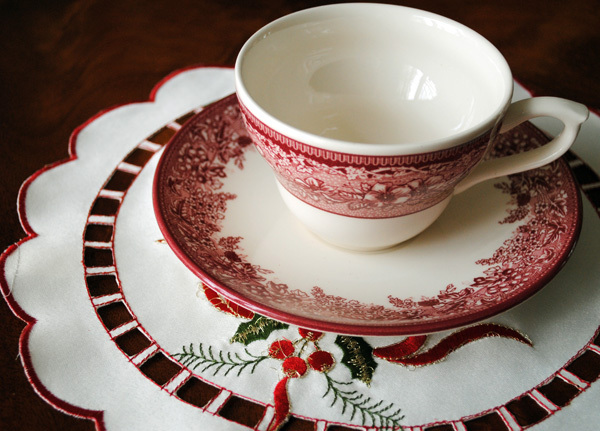 I think your teacup and plates are very pretty and a good pattern for Christmas. I would have been attracted to the berries also:) Your post today was like a lovely Christmas care, wishing everyone cheer and joy. Thank you! I always always love your teacups collection and it's gorgeous and perfect for christmas. I'd love a chance to win the giveaway teacup, it's so adorable! i'm of course already your follower. every week I join your and Terri's fabulous party. And you two ladies have each a beautiful collection of fine china and wonderful items. I couldn't resist each of your dreamable cups. Both of you share week for week richly from your wealth of decorations, ideas and tea cups. The cheery tea cup is really perfect for the season. I love to be part of this sophisticated party with people who adore the beauty of a well set table. You are so generous to offer so many nice giveaways. I would surely love to win the tea cup or the nice descorations set. I wish you a wonderful cheery christmas time in harmony and love. How very nice of you to have these giveaways, Terri! 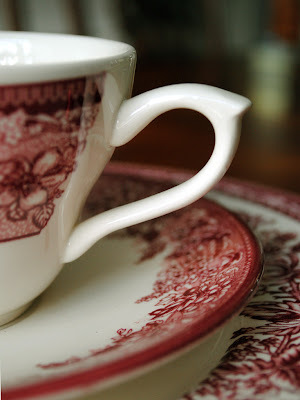 I love reading your blog and learning a little something about the teacups you post. So wonderful to meet up with cyber friends once a week and share common interests. I try to look at the blogs from your regular posters. Okay, I'm going to have to come from out of hiding one of these days and get my own blog started! Hope you have a wonderful Christmas. 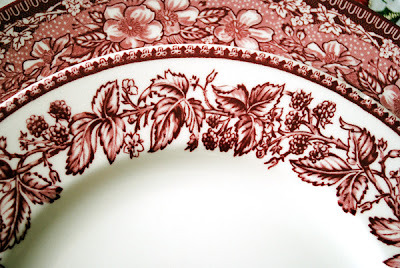 I find this red transfer china a beautiful and original choice to share for Christmas! It's really festive! Thanks for hosting these wonderful teas and enjoy your Xmas days with peace, joy... and family. Merry Christmas, Terri! How lovely your berries and white set setting! Very cheery, indeed! And, please DO ENTER ME in your give away! What a lovely prize to add to my collection! Always a delight to see what beautiful things you show off here - and all your warm wishes. Bless you! 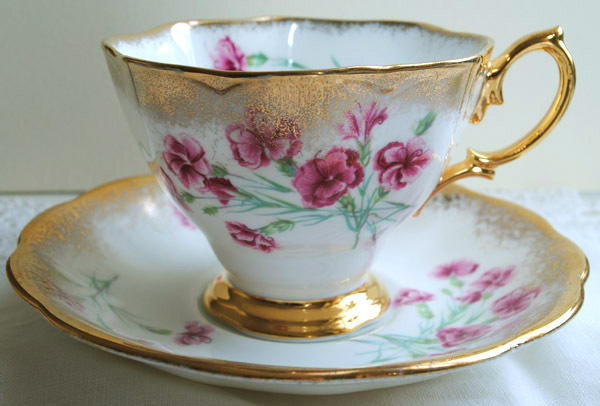 Oh my....this teacup would look so pretty in my curio cabinet!! Thanks for the chance to own it! What a gorgeous l'il tea-cup! LOVE at first sight!!! Thank you for the chance to win this precious treasure! Oh Terrie..you are always so super generous! I would love a chance to win this dazzling set ! And I love this festive red tea set..wonderful for the x-mas spirit!Gorgeous photos as always..love the red bell! Wishing you a beautiful holiday and magical new year! 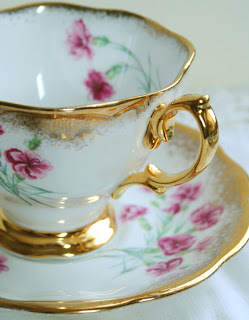 I LOVE your beautiful site, your tea cups and all the other wonderful things you share on your blog. Thank you so much for stopping by mine, leaving your comments and becoming a follower. I so appreciate the support. I love keeping up with your page, and being a part of Tea Cup Tuesdays! God bless you and have a wonderful Christmas. 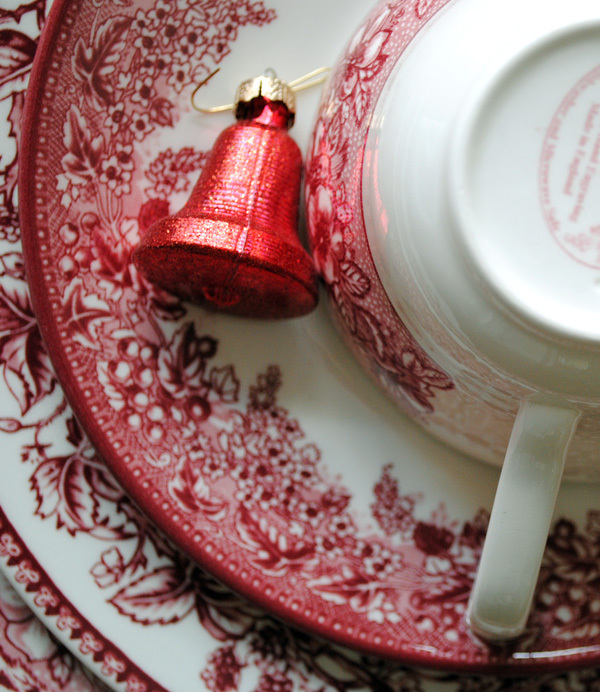 Your red and cream teacup is very pretty! Great for the Christmas season! 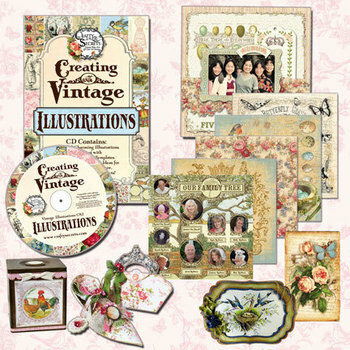 I would love to be entered in your giveaway of another beauty. Merry Christmas wishes to you and yours! Dropping by to wish you a very Happy Christmas and wonderful New Year :) Can you believe how this year has flown by? Merry Christmas to my BFF girlfriend. Here's to a marvelous new year for both of us. Hugs! Terri..just wanted to wish you a very Merry Christmas, and a healthy, happy, abundant New Year. what a delightful cup and saucer. christmas and the New Year will bring joy and happiness. The red and white dishes are just gorgeous! You are so generous about sharing your ideas, your photos, your love for blogging and friends . . . I hope you are having a lovely Holiday Season! Hi Terri.....each time I stop in I am ALWAYS amazed at your wonderful collection of tea cups. The one in your giveaway is fabulous. I've been a follower forever, please throw my have in the ring. 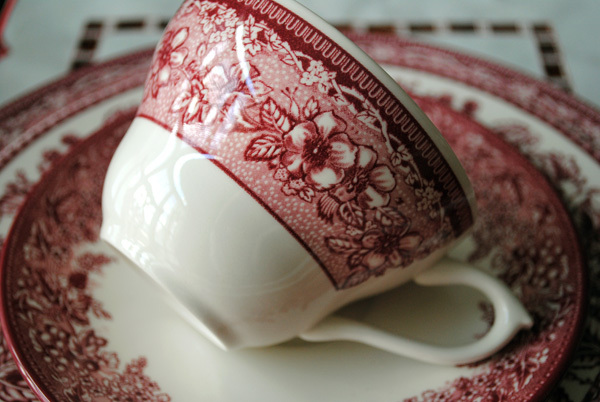 Would love to win your lovely teacup to add to my collection; always enjoy seeing your teacup Tuesday post. Enjoy all artwork but teacups are my favorite. Thanks so much--have a happy, joyous New Year! can't have too many teacups. thanks for the chance to win. happy new year and wishing you much success. Here's my entry to your teacup givaway. I so enjoy Teacup Tuesday. Thank you so much for sharing these lovely works of art. Holly M.